DENVER (AP) -- Justin Teilhet doesn't remember hearing a boom or feeling a sting, just waking up numb on the treeless tundra high in Rocky Mountain National Park and discovering his good friend was trying to revive his wife. It was a lightning bolt, he learned later, and it killed his wife and left him with a burn on his shoulder and a cut on his face when he was knocked to the ground unconscious. Lightning killed two people last weekend just miles apart in the popular park, where summer storms can close in quickly with deadly results. Rebecca Teilhet, 42, of Yellow Springs, Ohio, was killed Friday while hiking on the Ute Crossing Trail at about 11,400 feet above sea level. Justin Teilhet and six other hikers were injured. 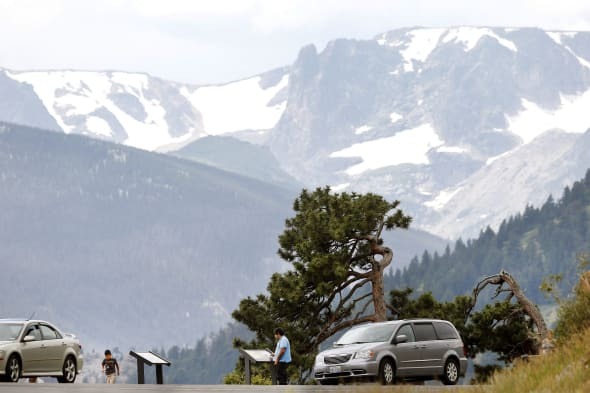 One day later and a few miles away, lightning killed 52-year-old Gregory Cardwell of Scottsbluff, Nebraska, at Rainbow Curve, a pullover on Trail Ridge Road with sweeping vistas from a vantage point about 10,800 feet above sea level. Three others were hurt by that strike. They were the first lightning deaths in the park since 2000, officials said. Thunderstorms occur in the park almost daily during the peak travel months of summer, and many produce lightning. "A storm blew in, and it came very fast," Justin Teilhet said Monday from his home in Ohio. "It started raining a little bit. We were hearing claps of thunder everywhere, but it there wasn't any lightning." His wife and his good friend Nick Tertel of Fort Collins were hustling back to the trailhead parking lot on Trail Ridge Road as the storm closed in. The next thing Teilhet remembers was struggling to lift his body from the ground, with one side numb. "I was walking, and then I was trying to stand up," he said, adding he had no memory of anything in between. "When I found Nick trying to revive my wife, I crawled to them and tried to help." Tertel also was injured but gave Rebecca Teilhet CPR and kept her alive until paramedics arrived, Justin Teilhet said. "He really was a hero at that event." Park officials said a helicopter was dispatched, but Rebecca Teilhet died at the scene.